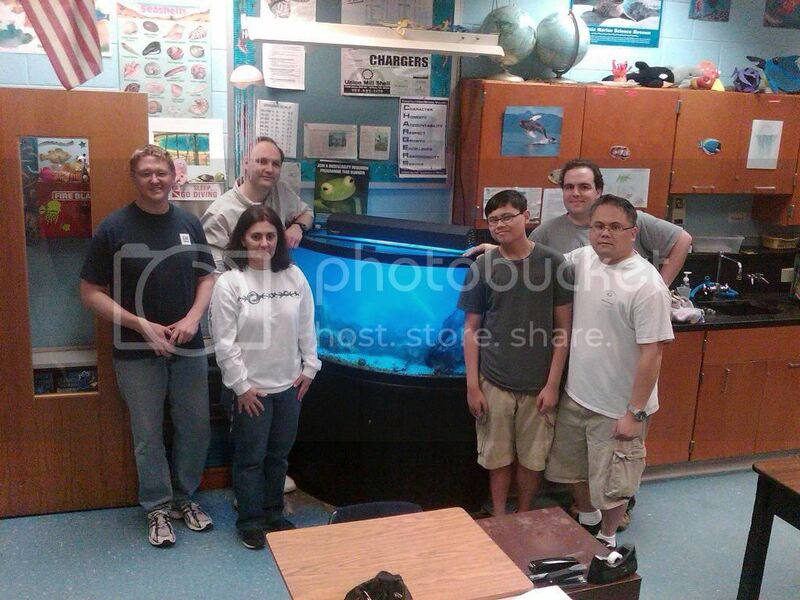 WAMAS members after working hard to provide a local high school Oceanography class with a reefRecently, WAMAS member Dave Sun was asked to help save Joanna Kulczak's tanks, an avid aquarist who recently passed away. Arrangements were made for one of the tanks to be donated to a local school. On February 26, a team of WAMAS volunteers consisting of Dave Frederick, Brain Ward, Steve Repp, Hilary Foster, Chip Frederick and Dave Sun dismantled the tank and brought it to a staging area.Former Chantilly student and WAMAS member, Josh Langland heard about a tank needing a new home connected his teacher and Doug Arthur, WAMAS President. Mr. Arthur, an electrical engineer, immediately contacted Ms. Gerbasi, a date was set, and the donation moved forward quickly. Then on Saturday, March 19th, Chantilly Oceanography teacher, Ms. Susan Gerbasi greeted additional WAMAS volunteers Dan & Dean Castro, Rob Gillette, Dave Lin, and Eric Wendling at the school to accept the tank and assisted in the set-up process. "It was a very long and complicated process," Gerbasi said, "It only took an hour or so to break-down the tank, but nearly 4 hours to set it back up again. Still, the results are fantastic! "The WAMAS mission statement in part states: "To further our understanding of the oceans and ocean life by providing education on the current status of the world's coral reefs and ongoing research in the scientific community regarding coral reefs." Toward that end, many of the organization's outreach efforts include assisting local educators with a variety of resources to further understanding of the world's oceans and the husbandry of the marine life therein. "Including the tank and all the necessary equipment to operate it, WAMAS also provided a host of live coral and fish. Thank you WAMAS, again for this extraordinary gift, for years it will provide hundreds of students with a window into our beloved world of coral reefs."